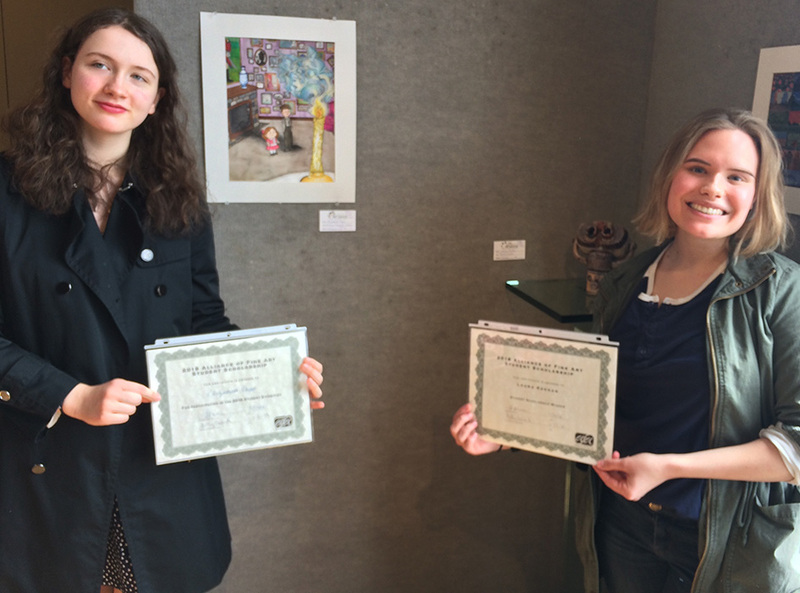 Each year, the Elmhurst Artists’ Guild raises money to award two $500 Scholarships for Elmhurst high school students who excel in the visual fine arts. At the beginning of the academic year; York High School, IC Catholic Prep, and Timothy Christian are invited to nominate senior students for this award. The nominations are gathered and the student portfolios are judged by members of the EAG on the basis of creativity and originality. The award ceremony occurs at the last EAG Member meeting in May, where the two scholarship winners are presented with a certificate of achievement, the monetary award, and the opportunity to speak about their artwork. In addition, two pieces from each of the scholarship winners’ portfolios will be represented in the Alliance of Fine Art (AFA) Scholarship Show in March to be judged among other art students selected from the following area artists groups; Addison Art Guild, DuPage Art League, People’s Resource Center, Naperville Art League, Downers Grove Artists’ Guild, Yellow House Artists, LaGrange Art League, Lombard Artists’ Coalition, Lemont Artists’ Guild, Plainfield Art League, Midwest Collage Society, and the Oak Brook Art League. That exhibit can lead to additional awards from the Alliance of Fine Art. In 2018, the EAM was proud to announce the scholarship awards for Laura Keenan and Elizabeth Dopp from York High School. Laura developed a series of ceramic pieces with a whimsical theme, and further won an award from the AFA for the piece titled, “Tunnel Vision.” Elizabeth created a series of ink drawings with an interest in a future in children book illustration. We applaud their fantastic efforts.